Silverware wrote: A wolf pack of 8 wolves, all equipped with beam lasers and Harpoon MRMs is freaking OP. I never considered going that route. Do you have to replace them regularly? I've got an Eagle, Sunder, Medusa and two Wolves at the moment. Trying to find a Heron so I can field some fighters, but not having much luck. 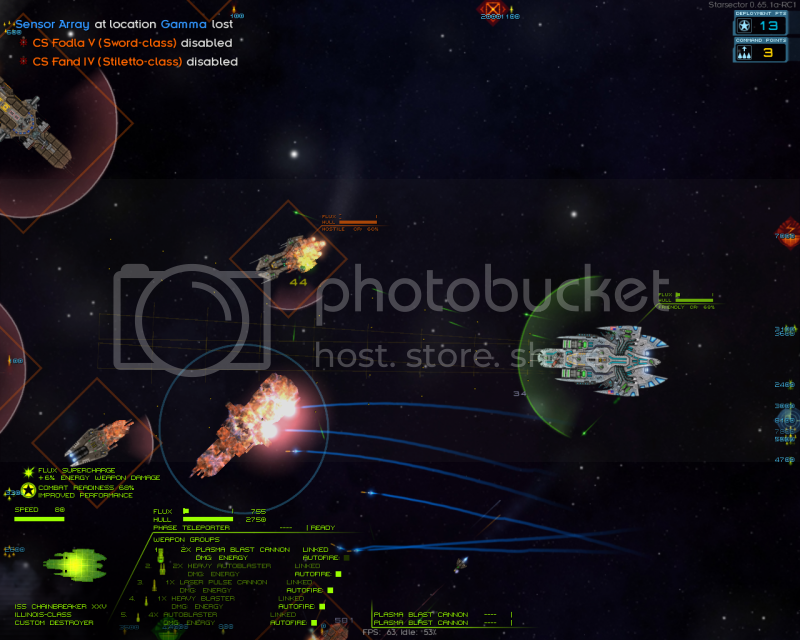 I've been playing Starsector today with the Ironclads mod! It's a good one. I'm not especially fond of Ironclad art direction. Too bad since the mod seems pretty ambitious. Yah, the ships in Ironclads are a bit cartoony, but don't let that put you off - it feels like a pretty complete game and there's a hell of a lot to do. It seems to me, that this game is heavily, heavily focused on combat. Is this a correct assumption? I've also read elsewhere (don't quite remember where, maybe their official forums) that trading really doesn't have the impact on the economic model as one would hope for. Is this also accurate? HowSerendipitous wrote: I never considered going that route. Do you have to replace them regularly? They tend to hold up well in fights. Taking them against anything too big is suicide. But either you win with no losses, or wipe entirely. I did try migrating to bigger things, but started taking far too many losses to sustain. Lots of new game mechanics in development for the next update! Another blog update?? Must admit, 0.7 is looking awesome. Looking good. Starsector is an awesome concept executed well. wizaerd wrote: It seems to me, that this game is heavily, heavily focused on combat. Is this a correct assumption? I've also read elsewhere (don't quite remember where, maybe their official forums) that trading really doesn't have the impact on the economic model as one would hope for. Is this also accurate? I've just seen this beastie.... Yeah, it's quite heavily focussed in combat, but the sandbox gameplay is getting more attention now that the combat is pretty much ready. But it's so very glorious. I'm just waiting a steam availability and some of the upcoming features to buy it (mining, industry build). This update gonna be good !